Great views from the elevated deck. While most people view the sights they see from the cruise ship as “wildlife cruising”, five minutes on Fat Salmon’s Wildlife Cruise and you’ll know that you are within an arm's reach of Alaska’s bounty. Alaska boasts some 3,000 rivers, 100,000 glaciers, and incredibly more than three million lakes. Alaska’s greatness lies in the magnificent treasures of its vast wilderness. 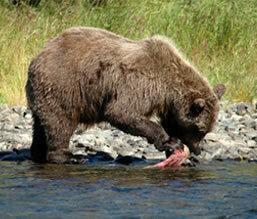 Wildlife roams through it all; bears, mountain goats, and in the water, whales, fish, seals and sea lions. 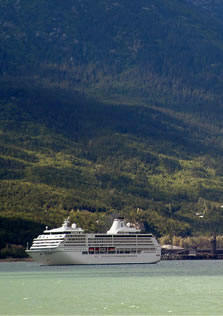 Your Wildlife Cruise is conveniently located in Skagway's small boat harbor just a short walk from the cruise ship dock. Experience it all aboard the fully equipped, twin engine vessel, Badly Bent. Fat Salmon Charters provides comfort, binoculars and the excitement that is sure to be the highlight of your Alaskan adventure. Master Captain Joe Warchuck enhances this enjoyable family-friendly cruise with interesting facts about the Alaska wildlife and historic Skagway. Whether you prefer a 360 degree view from the fly bridge or choose the lower deck to be closer to the action, you will need plenty of film for your camera to capture each spectacular moment. The Inside Passage abounds with towering glaciers, green forests, and incredible sightings of Orca whales surfacing the gleaming green blue water of the Lynn Canal. 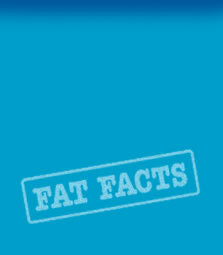 Numerous species of whales can be spotted during the summer months. Humpback whales generally surface close to shore when feeding and Orca whales are identified by their distinctive black and white markings. 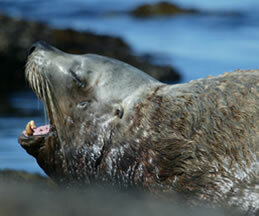 Sea lions bark loudly from the rocky banks and are especially abundant when the salmon are running. The Inside Passage consists of fjords and thousands of islands separated by the Lynn Canal. Glaciers are a large part of any Alaskan experience and Skagway has glaciers within viewing distance from your vessel, Badly Bent. Bears feast on berries and salmon and from the water, bears can be sighted along the shore or on gravel bars. Bears are wary of humans and have both keen smell and hearing; you are most likely to see them from a distance on a hillside. Mountain goats are often seen high in rocky outcrops. Bald Eagles circle high along the shoreline and scout the terrain below for dying salmon that are being washed ashore. 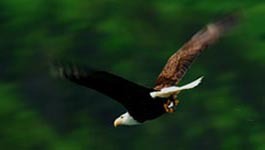 The nest of the Bald Eagle can be six feet wide and sits atop tall trees, like cottonwoods. Unlike some other charter companies, Fat Salmon Charters only offers the one wildlife experience. All of our tours are “eco” based tours. We include the whole Alaskan experience and try to put you in the action that Alaska’s amazing wilderness is waiting to provide. Spend two hours with us, slowly working our way around the Lynn Canal. We begin by crossing the wide canal for a look at Historic Dyea to see the amazing and quick moving Dyea Flats. Dyea was the sister town to Skagway during the Gold Rush of 1898. Working close to shore, watch the beautiful show that nature has put on for us! The cruise will continue to the old salmon hatchery and rural house in the wilderness across from Skagway on the Lynn Canal. Continuing the cruise down the valley, we stop again at Seal Rock to visit with our favorite sea friends. After crossing the wide canal again we’ll visit High Falls where Captain Joe will get you straight under the falls! We spend as much time as you would like at the falls for photos and questions. On our way back to Skagway, we’ll stop to visit some of our oldest residents, a male and female Bald Eagle. Always willing to pose for photos, it is a great way to end this unforgettable experience. Fat Salmon Charters is built around the idea of the true Alaskan experience; we will make sure that you get your very special piece to take home.